The enterprise master person index (EMPI)2, or patient registry, has an essential role to play, facilitating trusted data exchange while protecting the privacy of patient information. An EMPI provides a real-time way to locate, identify, match and cleanse information about a person from many sources to create a comprehensive view for authorised health service providers. It is proven to reduce duplicate records within and across systems to improve patient administration and care delivery. 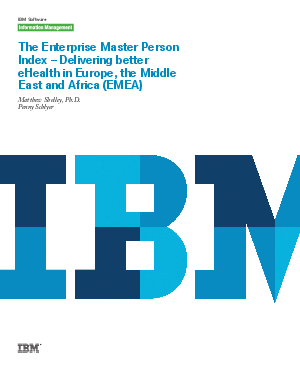 This paper explores the advance of eHealth and the role of the EMPI in its future. A variety of roadblocks have to be negotiated for eHealth to achieve its potential, some technical, others social and economic; an EMPI at the foundation can do much to help. Some of the most important issues that must be addressed include the type of information being made available, and to whom. For example, mental health records, certain test results or children’s health records can be very sensitive and should only be shared with certain individuals during specific episodes of care. An EMPI accurately associates the right records to the right patient, ensuring accurate identification at the point of care. It can be architected to only identify where all relative records exist or to enable information sharing for an electronic health record (EHR), portal or other sub-specialty applications. Because of this flexibility, the EMPI can help deliver three essentials to advance eHealth and provide the basis for trust including protecting patient privacy, ensuring data quality and accurately identifying the patient.